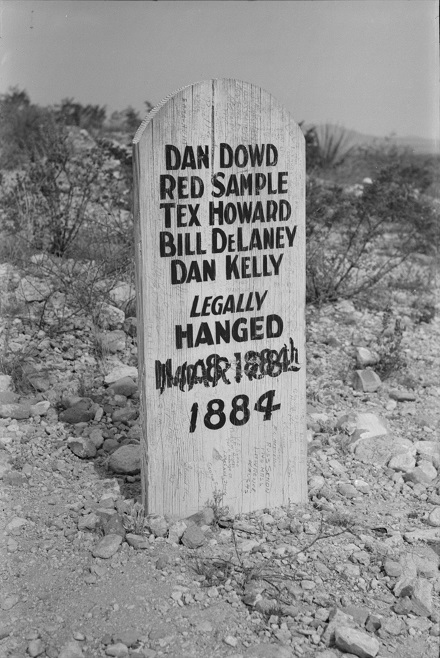 The frontier town Tombstone, Arizona saw its first legal hanging on this date in 1884 — and its second, third, fourth, and fifth besides. On the 8th of December ult., Daniel “Big Dan” Dowd, Comer W. “Red” Sample, Daniel “York” Kelly, William “Billy” Delaney and James “Tex” Howard rode into the nearby town of Bisbee in an attempt to seize the $7,000 payroll for the Copper Queen Mine. Sadly the bandits mistimed the arrival of the boodle. Having already committed to the raid, they improvised a plunder of the general store and the valuables of any nearby customers they could lay the sight of their sixguns upon. And then on the way out, villainous mustaches a-twirl, the gangsters shot up the town and slew four good residents of Bisbee. This Bisbee Massacre was just two years on from Tombstone’s signature moment, the Gunfight at the O.K. Corral — and it had a similar whiff of the lawless frontier. Arrayed against Wyatt Earp and Doc Holliday at the O.K. Corral** had been the so-called “cowboys”, a network of desperadoes who found this last vanishing enclave of the lawless frontier a congenial environment for opportunistic outlawry: livestock rustling, smuggling, stagecoach robbery, and the like. The line between legitimate businessman and criminal element was as permeable as the nearby Mexican border. As Tombstone’s posses hunted down the five Bisbee shooters over the ensuing weeks, interrogations would reveal that Bisbee saloon-keeper John Heath — an Ohio native of shady reputation who could be found during the gunfight cowering behind his own bar — was actually the moving spirit behind the raid. He would later testify in a piece of hairsplitting vainglory that of course it was he who conceived it all, as his henchmen were too stupid for such a plan … but the part where they started shooting people was none of John Heath’s idea. Heath was smart enough to get his own trial separate from his goons, and smart enough to work a jail sentence where his cronies were set up for execution. 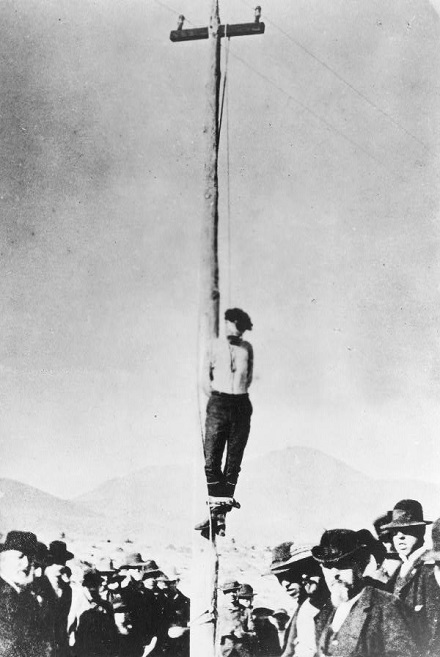 Folk in Tombstone were incensed at this leniency and on February 22 they reversed it by extracting Heath from his irons and lynching him to a telegraph pole at First and Toughnut. The Alfred Henry Lewis Wolfville books (available in the public domain) dramatize a fictitious western town loosely based on Tombstone … complete with vigilance committee and a strong female character named Nell. It was fairly clear under the circumstances that the five toughs awaiting their March 28 hanging date had no need to entertain any hope of mercy. Nonetheless, legendary frontierswoman Nellie Cashman — later to be inducted into the Alaska Mining Hall of Fame for her exertions in that arctic gold rush — was at this time resident in the silver boom town of Tombstone. So appalled was the Irishwoman at the highly improper festive civic atmosphere prevailing in Tombstone as the executions approached that she organized a gang of her own: a team that on the eve of the hangings secretly dismantled a grandstands some ghoulish entrepreneur had erected in order to at least permit the event to go off with some modicum of solemnity. * Cochise County, Arizona, was named for the great Apache warrior. ** Actually, the shootout was neither in nor abutting the O.K. Corral.